Sitting in the middle of the jungle, early b1988 in Liberia, West Africa, working for the Bong Mine Company, I found the left advertisement in a workshop of the Mine’s concentrator. I had worked with the Mine since August 1985, first as Head of Material Accounting and later on as Cost control and Budgeting Officer. Of course Costa Rica drew my attention, having bought six years ago a “Finca” in Guanacaste. It was anyhow a stupid move. I was in London, a friend called me and offered the Land. I accepted on the phone without having seen it. 6 hectares 805squaremeters, USD 25000,-, the seller for sure was happy having found such a half wit . As I later found out, the price was 3 to 4 times over the market price in 1982. The Bong Mining Company, founded in the early seventies, was an open pit Mine, exploring the Bong peak for iron ore. About 200 expatriates with their families worked there. Germans, English, Austrians, Polish, Turks and Italians – a really scattered community. All imaginable amenities made life bearable: Tennis club, Shooting club, Aero club, Golf club – every possible leisure time activity was covered. New comers were obliged to assume the administrative duties. Immediately after my arrival, I was promoted to President of the Golf Club. But I was not happy, my personal difficulties, explained somewhere else in this site, isolated me – my arrogance, combined with shyness – did the rest. In these days I discovered my computing ambitions. Having my first personal computer, Word and Multi-plan (Excel) installed, I tried every evening new steps in these fascinating worlds. So I thought, to write a job application for this ad would be a nice training . No type writer, no tipp-ex, no repeats. All stored and formatted. Reading the ad carefully, I realized that the publishing company had really no idea which would be the ideal person for the offered position. They have been looking for a “Maschinenbauingenieur” (mechanical Engineer ) for developing an accounting system. A Warehouse (Inventory) system is one of the most complicated auxiliary books in an accounting system. A value and quantity system, which no Engineer can design and implement. And that exactly I wrote. Not forgetting, that I was able of doing it. Formatting, spell check, printing – another night at Bong was killed. Next morning, sitting in the Mess Hall , a friend of mine shouted: Leaving for Germany, any letters? I really don’t know what happened. Yes, I said. Wait a second – drove to the house , put my training application in an envelope – and it was gone. 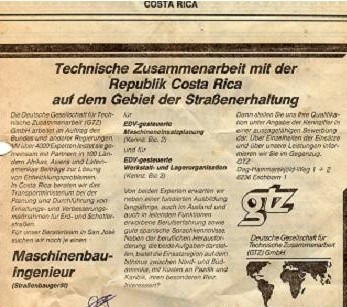 Three days later, sitting in my office juggling with figures, the telephone rang, the operator said, an urgent call from Germany – three month later I arrived in Costa Rica. Interested about the Bong, please check: The Bong town community. Half a year after leaving Liberia, the Mine was over run by the Taylor Gang , the expatriate community evacuated – this was the end of an astonishing bio top between black and white. Might be interesting what happened to the finca? In 2004 I put a sign up, quoting Mark Twain:” Buy land, they don’t make it anymore”. A Frenchman thought this might be the chance of his life and gave me a 1000% gain. In the retrospective, I consider this events really as “Sternstunden” of my Life. The decision to sent the job application gave my Life a completely new direction: a navigational beacon was reached and I altered course.